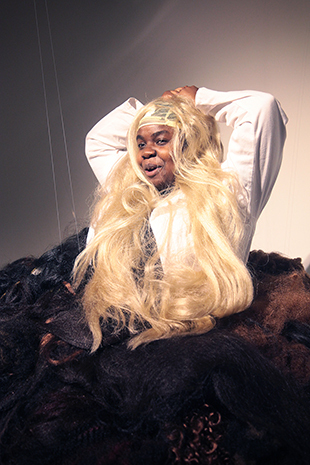 For performance artist Selina Thompson, bigger is always better. The last time I interviewed (read interview) this bright young woman she was spending her evenings being made into a giant cake for her show Chewing the Fat. Thompson’s work deals with the politics of identity and the complexities of self-image. In her new play Dark and Lovely, the artist will be delving into the much debated topic of black hair. In true Thompson style, the Birmingham lass will be conducting her show from inside a giant ‘tumble-weave.’ This eight foot structure is comprised of abandoned weaves and extensions, physically representing the issue at hand. When asked what inspired her to create this show, Thompson explains that online discussions prompted her curiosity. 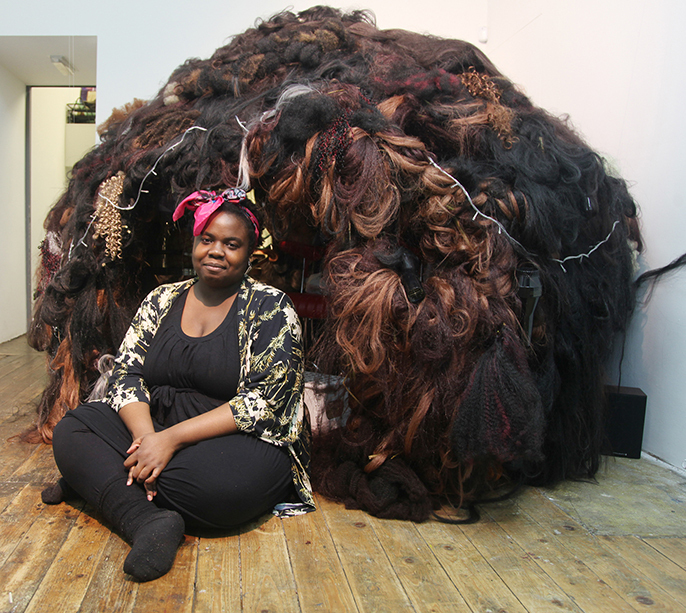 Currently sporting an afro, the Leeds based artist reveals that she has had a volatile relationship with her own hair. In an unusual hairy tale twist, Thompson’s hankering for straight tresses resulted in her suspension from school. Thompson’s work aims to connect with her audience on personal level. 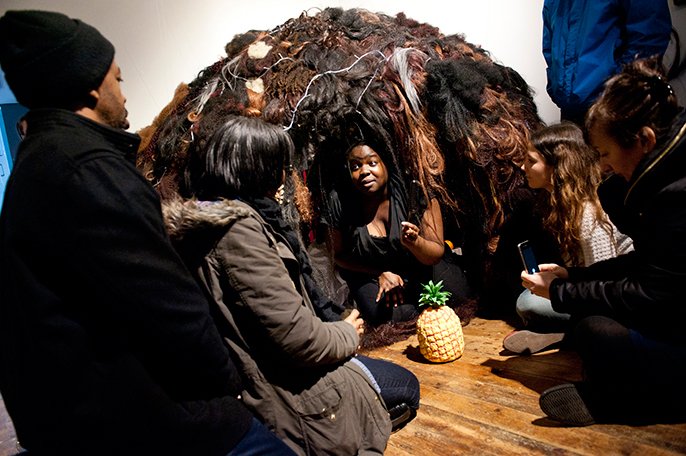 Dark and Lovely can host an audience of up to 40 people and the artist is eager for show-goers to get involved, saying “I want people to have a good chance to get their hands in the tumble-weave.” The show creates an intimate setting with lashings of rum punch and direct conversations with the audience. Thompson’s inclusive approach is partly her innate generosity of spirit which shines through during the interview. It is also an intelligent method of deconstructing vast social issues and relating them to the individual. 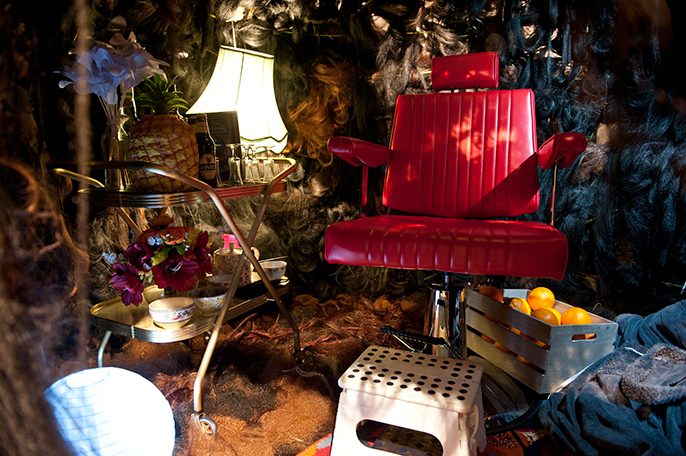 The domestic ambience is extended by Thompson having her hair done during the show and beauty products being made live on stage. Whilst touching the tumbleweave is encouraged, Thompson advises me against jumping on it. (Well, I had to ask.) She admits that creating the hirsute structure proved quite a challenge. 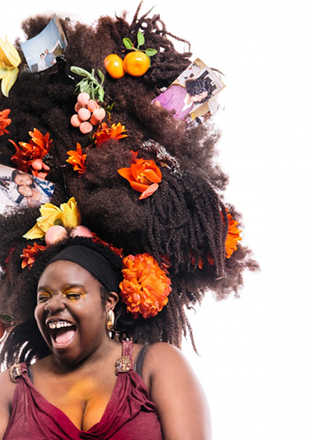 In researching her show, Thompson has explored the plethora of factors which inform attitudes to hair. The artist has delved into the cultural, political and financial implication of the matter and explains that money can play a key role in how people style their hair. Even now, for my nan natural hair is not OK. She’s always asking when I’m going to get my hair braided, for her it looks messy and unkempt. Black hair has become a hot topic in recent years. This can be partly attributed to Chris Rock’s 2009 documentary Good Hair, which placed the subject in the media spotlight. Thompson reveals that she has watched the film but has some misgivings about Rock’s approach. Thompson is fiercely opposed to generalisations. In her expansive analysis of the topic she has taken not only current but historical perspectives into consideration. Her paternal grandparents are from Ghana and Jamaica and from Jamaica and Monserrat on her mother’s side. She explains that for their generation, there was an overwhelming pressure to conform to the standard image of respectability. Thompson interviewed numerous people on her Dark and Lovely travels and recordings of these conversations will feature in the show. She will also be sharing her own experiences and is keen for her audience to get involved in the conversation. Placing focus upon storytelling and togetherness, Thompson’s playful approach is sure to get under the scalp of the black hair debate. With so many factors informing this one subject, there are multiple reasons to see this show. Thompson expounds the show’s universal appeal perfectly. Info: Selina Thompson’s Dark & Lovely (see listing) is at Ovalhouse Theatre from 7 to 17 October 2015. Book tickets / Visit Selina Thompson’s website for details on the national tour.